MYRTLE BEACH, SC (WMBF) – It's a boy! 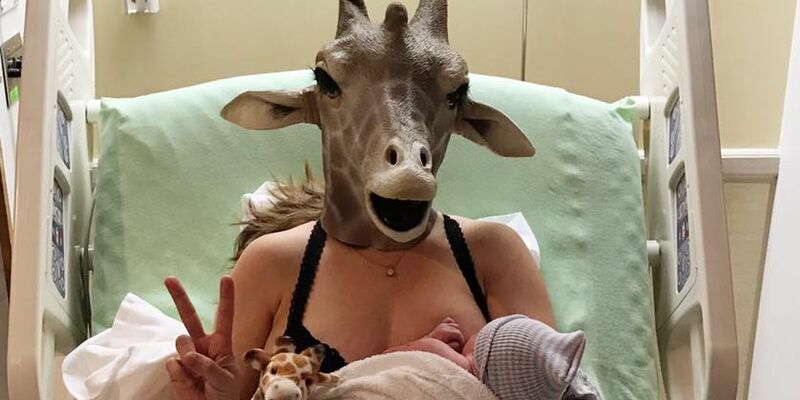 Erin Dietrich, the Myrtle Beach woman who became a viral sensation when she livestreamed her impression of April the giraffe, is a mom herself once again. According to a post on her Facebook page, Erin and her husband, Scott, welcomed their son, Porter Lane, at 6:11 p.m. Wednesday. "He's here!! He is perfect, healthy and just beautiful," the post stated. In keeping with the theme of her recent online fame, Dietrich is wearing a giraffe mask in the photo while holding the baby. "Our hearts are overflowing," Dietrich wrote in the post. "Thank you so much for ALL the love and prayers! XOXO"
On Sunday night, Dietrich streamed live on Facebook as she paced about her Myrtle Beach bedroom, wearing leggings and a giraffe mask. Her video, which now has over 30 million views, poked fun at the livestream of April the giraffe, who has had millions of people glued to their screens as they wait for her to give birth to her fourth calf. Wednesday afternoon, Dietrich again went live on Facebook from the hospital.